Comcast offered to get internet service to (96% of) the good people of Charlemont, Mass in exchange for a $462,123 subsidy; instead, the town of 1300 voted to reject the offer and spend $1.4M to build their own super-fast fiber network. The town will charge $79/month for symmetrical gigabit access with no data-caps, and people can add phone and TV service for an extra payment. 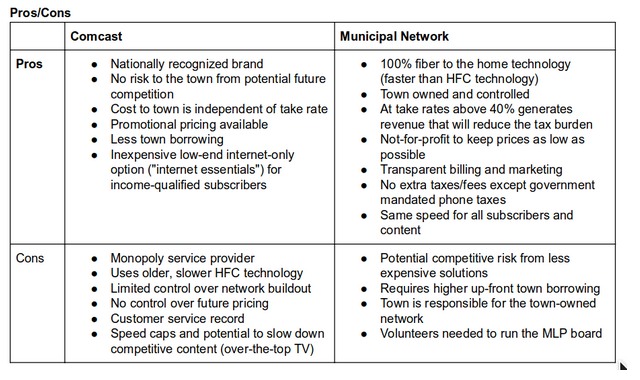 If enough townspeople sign up, there will be no extra taxes levied for the network rollout as they will be able to cover the whole costs through subscription fees. Go Charlemont! Today, you are the smartest people in America. An increase in property taxes would cover the construction cost. But the town would also bring in revenue from selling broadband service, and potentially break even, making the project less expensive than Comcast’s offer.